Oilers drop Game 1 of a best-of-seven series 6-4 to Kansas City at the BOK Center. TULSA, OK– A late power play goal by Kansas City’s Jared VanWormer broke a 4-4 tie and spoiled the Tulsa Oilers’ return to the Kelly Cup Playoffs, presented by SmileDirectClub, Thursday in Game 1 of a best-of-seven series at the BOK Center, as the Mavericks won 6-4 to take a 1-0 lead in the series. Oilers rookie forward Roman Ammiratobroke the ice 3:25 into the game when he tipped a point shot in the right circle, re-directing the puck past Mason McDonald to give Tulsa the early lead. Stephen Perfettomade it 2-0 when he danced past the Mavericks defense at the blue line and ripped a shot under the crossbar just over four minutes later. Kansas City cut its deficit to one when Greg Betzold beat Devin Williamson the blocker side with a quick wrist shot from between the circles on a Mavericks power play. Tulsa led 2-1 after 20 minutes and held a 12-7 shots advantage. The Mavericks rattled off three unanswered goals in the middle frame to lead 4-2 after two periods. Loren Ulett tied the game at 2-2 with a deflection on a shot from the point. Corey Durocher gave Kansas City the lead for the first time when he banged home a rebound on the edge of the crease. C.J. Eick then buried a goal from the slot on a broken play with 19 seconds left in the period. Alex Dostiebrought the Oilers back to within one when he scored 34 seconds into the third. 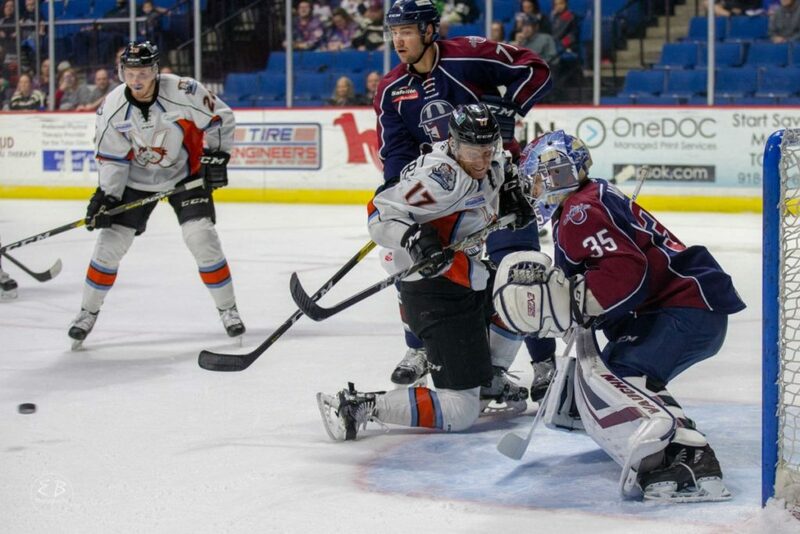 The 21-year-old scored again 4:43 later to pull Tulsa even at 4-4 with his second of the stanza. The Mavericks picked up a late power play and Jared VanWormer capitalized with a backhander off of a rebound in the low slot to put Kansas City back in front 5-4 with 3:57 to play. Rocco Carzo added an empty net goal in the final minute. Game 2 of the best-of-seven series is Sunday at 4:05pm at the BOK Center. The series then shifts to Independence for Games 3, 4 and 5 (if necessary) at Silverstein Eye Centers Arena next week. Call 918-632-7825 or visit www.tulsaoilers.comfor more information on playoff ticket packages, including group discounts on tickets to Game 2 Sunday at the BOK Center. Single-game tickets are also available on www.ticketmaster.com.